I’m thinking about buying the new Celestron Focus Motor for SCT and EdgeHD - 94155. The reviews seems positive but I really haven’t heard from anyone about how well it works with SGPro. I have a Celestron 8" SCT and Canon 60D as my primary camera. All comments will be appreciated. If Celestron releases a robust ASCOM driver for their new focuser, then it will work perfectly with SGP. If they don’t, then it won’t – at least not right now. 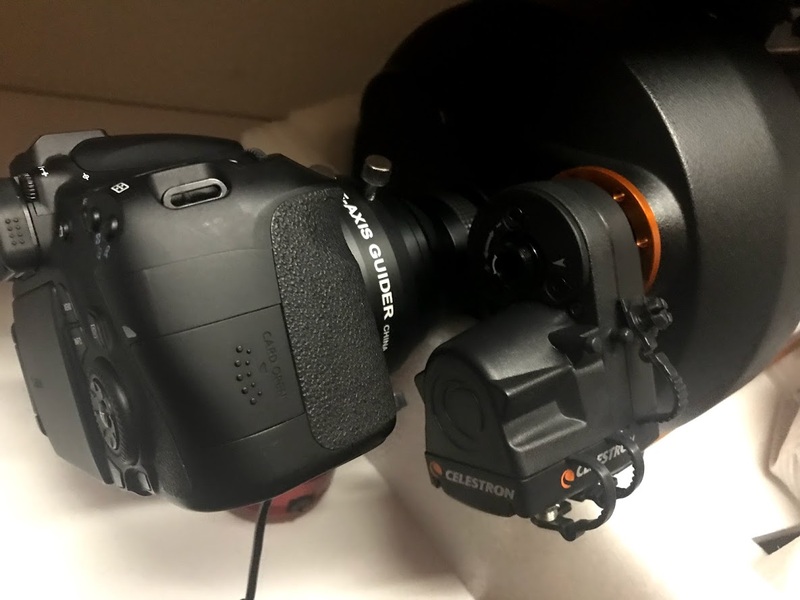 I have the unit and am using the Celestron USB Focuser Driver (ASCOM) – it works with SGP but being a newbie I have not been able to get autofocusing working yet. I’m sure it some settings I have to play with. The focus motor works just fine “manually” focusing with a Bahtinov mask. However on the C6 scope the attachment bracket leaves something to be desired because of the position of the screws. I think it would be the same on a C8 but since the scope is larger it probably won’t occlude using larger pieces of equipment as it does on the C6. On larger scopes, the three screws to attach the orange bracket have the opposite orientation relative to the center so the ‘divot’ shown in the bracket is next to the center instead of on the outside. Three more screw holes and the bracket could be oriented the other way, I may get a spare bracket and drill them myself. 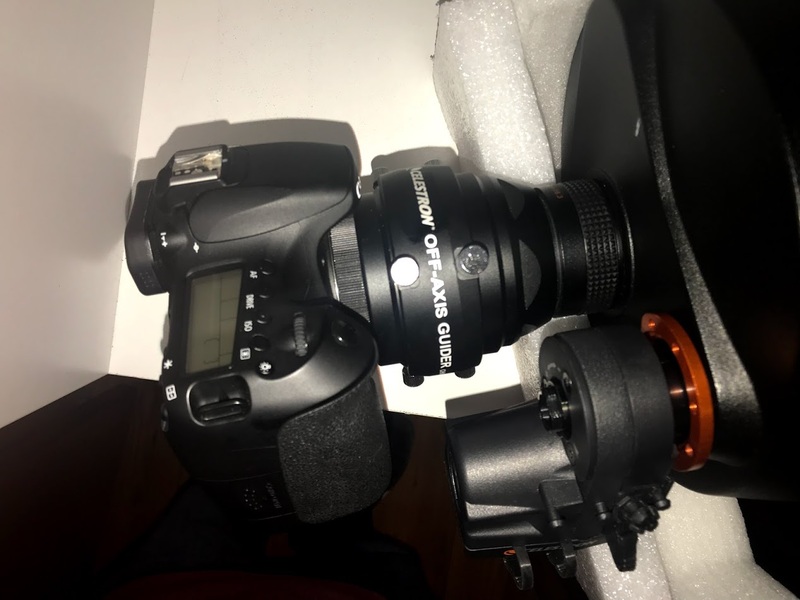 I just purchased the Celestron Focus Motor myself and spent the better part of yesterday installing it on my Celestron 8" SCT. As you can see from the photos there was a surprising amount of clearance between the orange base plate/focus motor and my large Canon 60D camera. I thought it was going to be a problem but it worked out well. I downloaded the Focuser ASCOM Driver from the Celestron website and installed it on my Windows 10 laptop. The problem I had was in the calibration. The calibration couldn’t get the focus shaft to turn the 60 revolutions that is common to the 8" SCT. After working the issue for half a day and calling Celestron support they suggested I extend the focus shaft as far from the OTA housing, remove the grease and replace it with 3 in 1 oil. Also look for damage on the long screw that the brass focus knob threads onto. After all of that I finally decided to look into the front of the OTA through the glass plate and moved the long screw to see if there was an obstruction. Sure enough, there was a threaded screw that was impeding the movement of the primary mirror. The longer screw was used to hold my original finder scope base. Once I removed the screw the calibration worked fine. I also had some minor problem with the allen wrench screws that secure the focus motor housing to the focus brass shaft. Make sure they are tightened all the way down. Using my neighbor’s roof I was able to ensure the hand controller worked to focus on the roof tiles. Due to the cloudy weather here in Bend OR, I haven’t been able to test the focus motor on some real stars so I’ll have to be patient. If there’s anyone else who has successfully used this focus motor with SGPro please let us know what focus settings worked best for you. BTW, what guide camera do you use with that OAG? I forgot to mention, I too had to tighten the shaft screw down really tight to insure the focus motor didn’t slip on the shaft – I tested by pulling on the motor before I secured it to the adapter. Once I couldn’t pull it off the focuser shaft I figured it was tight enough. I’m using the ZWO ASI224MC camera. It seems to work well with the rest of my gear. I’m hoping for some clear skies tonight to be able to test out this focuser. I’ll keep you posted.